If more loading zones are freed up, officials eventually could change some of those loading zones to public parking, Mah said. “Allowing private employer-provided shuttles to use already established public transit stops will attract more riders who may otherwise drive to work,” Mah said in an email, calling the pilot “an innovative solution” to opening up roadside space. Microsoft’s service, called The Connector, shuttles an average of 2,160 round-trip passengers each day, while Seattle Children’s shuttles record 2,300 average daily boardings, according to the companies. 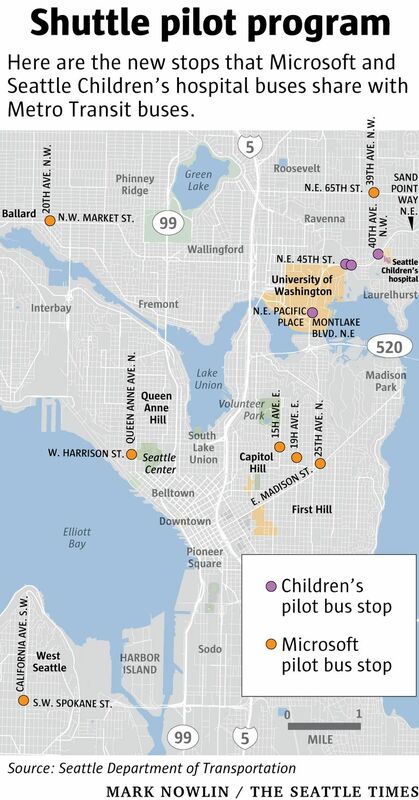 Both Microsoft and Seattle Children’s have either expanded routes or seen spikes in ridership since the launch of their employee-only shuttles roughly a decade ago. “There’s this kind of revolution happening in transportation with the proliferation of private transit,” including the growth of company-owned shuttles and ride-hailing services such as Uber and Lyft, said Don MacKenzie, a University of Washington transportation researcher. “It’s likely that we’re going to see continued efforts to renegotiate who has the right to that transit space,” he said. Quantifying the growth of company-owned transit is difficult. According to Sohier Hall, CEO of Luum, a Seattle-based company that helps employers with commute planning, no one knows exactly how many private employee shuttles use Seattle roads. Mah said neither SDOT nor Metro tracks the number of shuttles. Microsoft’s service take workers to and from the software giant’s Redmond campus, while the hospital’s fleet carries employees between its main campus in Seattle’s Laurelhurst neighborhood and transit hubs and other work sites. Similar private shuttle services are common in the Silicon Valley area, with Google, Facebook and Apple, for instance, running networks of tech buses throughout the area. That system made headlines in 2013 and 2014 when activists who say the buses represent gentrification and soaring housing costs staged protests, blocking shuttles in a popular tech-employee neighborhood and breaking a window of a Google bus in Oakland. People in Seattle have lodged similar complaints, though protests against the buses, specifically, have not reached the fever pitch seen in San Francisco. For Microsoft’s service, a computer system tracks ridership based on employees registering for rides. The system also creates personal profiles for each rider that show how much carbon dioxide he or she saves by taking a car off the road, for instance. And since the buses have Wi-Fi, Microsoft can get some extra work out of shuttle commuters, too. 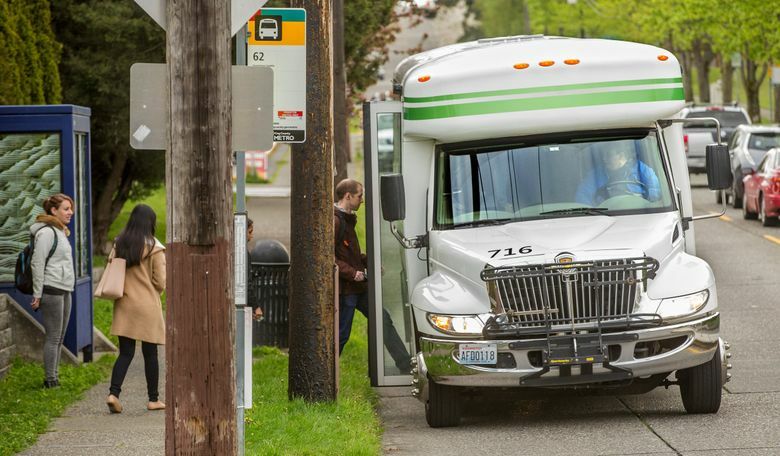 The data help the company reconfigure routes and stops to serve the most riders as efficiently as possible, said Microsoft spokesman Lou Gellos, who takes the Connector daily to and from his Capitol Hill home. He says the bus reduces his evening commute time significantly. The Connector expanded years ago to its current system of 22 routes that include 54 stops total, extending as far north as Mill Creek and as far south as Kent. Its fleet has 80 buses, some larger than others. Microsoft paid a $300 fee for each bus that uses the Metro stops, Gellos said. Seattle Children’s has paid the same amount for all 16 of its shuttles, said Evan Koch, a hospital spokesman. That revenue went to the city’s transportation operating fund, according to SDOT’s Mah. By comparison, Metro Transit has about 3,100 stops in Seattle and roughly 1,400 buses in its fleet. According to Jamie Cheney, the Seattle Children’s director of transportation, ridership on the shuttle service spiked after the March 2016 opening of the light-rail extension to the University of Washington and subsequent changes to bus routes in northeast Seattle. Rachel Ghosh, 31, a nurse at Children’s, is part of that trend. She rides light rail from the Westlake Station near her downtown home to the University of Washington, where she hops on a shuttle for a quick ride to the hospital campus.